This is a review of the Enchanted Bracelet equipment for Game of War which is part of the Xenas Gear equipment set. This item contains 4 combat boosts, all of which are defense orientated. Whilst none of the boosts are particularly strong in their own right, the combination of the 4 make this the best combat accessory on offer. It is notably better than the Violent Beauty Wings and a lot better than Jenocide. 4 combat boosts, 3 of them related to defense. This item is ideal for taking hits of any sort or protecting your troops when attacking. Requiring for seasonal materials, 2 of which are rare. This is very hard to build. It however is well worth the cost if you can afford it. Taking first place from the violent beauty wings this is now the best defensive combat accessory. It’s not easy to build but well worth the cost. I currently have 3 sets of Violent Beauty Wings, would this Accessory be worth crafting and swapping out a set of wings for Solo attacking and Rallies where I’m not using all Relics and Cores? Hi, It really depends on your funds. 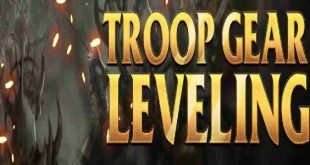 Most players that have access to 6 x gold wax for a full set of these would prefer to focus on Troop Attack in which case the Violent Beauty Wings are actually better. Check out the Suicide Gear here for more info. Also worth bearing in mind that most new equipment MZ release is superior to the previous set. In which case we could be getting some even better accessories next month. I had the chance to make one of these.. to put a long with full xena attack set.. I opted for fortress armour and undeniable toes shoes instead. . Good decision?